An inspiring mix of would-be waste warriors from supermarkets, academic institutions, charities and campaigning organisations were among those attending Brighton & Hove Food Partnership’s recent roundtable on food waste – one of a series of roundtables being held this year as we lead the work on refreshing the city’s food strategy and aim to become the UK’s first gold Sustainable Food City. We knew we were starting from a place of good intentions with food waste when we sent out the invites to our event. Our surveys this year aimed at the city’s businesses and residents had a big uptake, with hundreds of responses showing that there is an appetite to shift food provision to a model that minimises both food waste and single-use plastic. However, seeing representatives from Marks & Spencer and Sainsbury’s alongside those from environmental group WRAP and ethical supermarket HISBE in the one room – all prepared to turn good intentions into action – brought the message home: food waste is not a side issue. It is increasingly recognised by all sections of our community. Our surveys showed a clear majority of Brighton and Hove residents who responded want simple measures introduced to help them reduce the amount of food being binned, for example the availability of takeaway boxes in restaurants and small packs of food in supermarkets. A clear majority of business respondents want to tackle food and food packaging waste too, with three quarters saying they are interested in opening themselves up to a food waste audit which would track the quantity and composition of the food waste they produce and analyse why it was being thrown away. Half the business respondents said they want more information on food waste collection options, and an impressive 40% are willing to take the plastic-free pledge. This is all important because our city’s food waste problems are big and they are urgent. In Brighton and Hove, a whopping 30,000 tonnes of food a year is wasted by businesses, and 39,000 by households. The round-table event (left) was held at zero-waste restaurant Silo and focused on developing practical actions aimed at reducing this huge food waste and packaging mountain. Other participants included representatives from the University of Brighton, University of Sussex contract caterers Compass Group, The council’s CityClean and events teams, as well as local wholesaler and bakery chain Real Patisserie. Implementing a Brighton and Hove branded doggy-bag scheme to promote and make it easier for people to take away excess food ordered from cafes and restaurants. Extending the use of paper ‘mushroom’ bags for bagging other vegetables in supermarkets. Producing stickers or laminated posters to make it easier for restaurants/caterers to understand how they can donate to organisations in the surplus food network. Next, we will consider all of these exciting ideas to determine which will prove both practical and most beneficial to go into a new five-year action plan, itself part of the overall review of the city’s 20-year food strategy, Spade to Spoon: Digging Deeper. These local aspirations tie in with the much wider picture – in particular the Sustainable Development Goal food waste reduction target of 50% by 2030. 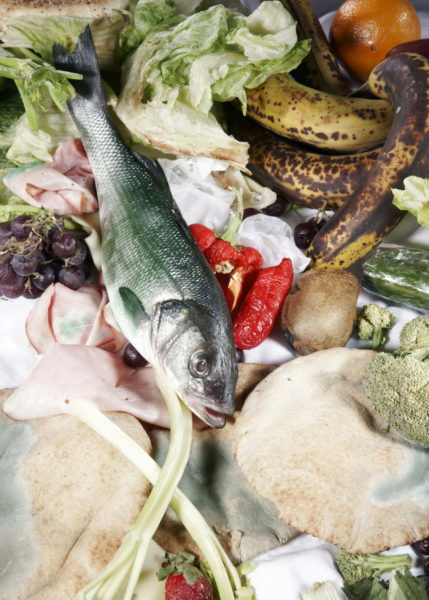 In the UK, £2.5bn worth of food is currently thrown away annually by businesses. That amounts to £10,000 per outlet per year. What’s more, 75% of that food could have been eaten. Vera Zakharov, Brighton & Hove Food Partnership’s Surplus Food Network Coordinator, who previously coordinated the city’s Love Food Hate Waste Campaign said: “It’s absolutely inspiring to see a broad range of stakeholders take this issue seriously. Food waste is a major contributor to global greenhouse gas emissions and is a symptom of a food system that devalues our natural resources and human effort. Other roundtables being held as the food strategy is refreshed includes those on shared meals, food power, land, and healthy and sustainable diets. We’ll keep you updated as they take place. 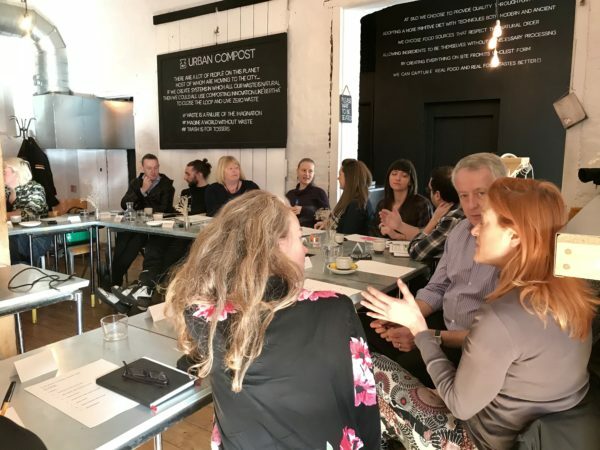 This entry was posted in Communications, Community, Environment and tagged Brighton & Hove Food Partnership, Hisbe, Silo, Vera Zakharov, WRAP on 12/04/2018 by srraadmin.